Bindi & Tex Mating has occurred!! 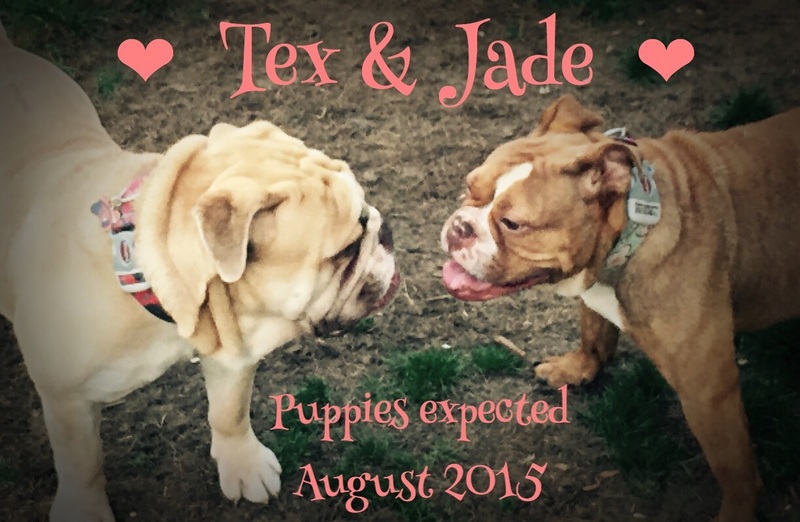 Tex and Bindi have officially been mated and puppies are expected September 24!! We are so excited for her ultrasound next week to confirm her pregnancy! Stay tuned for a new ultrasound video on our YouTube channel!! We are so happy to announce that Jade and Tex had 11 beautiful and healthy puppies and Mama and babies are doing great!! This is an amazing litter of all liver nosed puppies and also some chocolate tris and Chocolate Trindiles! So greatful for our amazing Vet Dr. Weber at Newberg Vet Hospital and all his amazing assistants. The delivery couldn't have gone any better! Stay tuned for lots of pictures on our website and also our Facebook and Instagram pages! We are so happy to announce that a natural mating has taken place between Tex and Jade! Puppies are expected approximately Aug. 9th 2015! 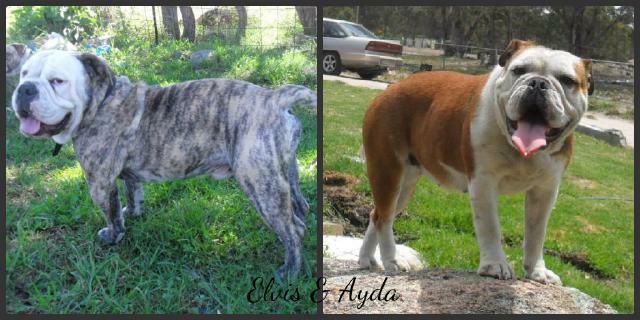 We can't wait to see these puppies!! We will do an ultrasound in one month to confirm the pregnancy and stay tuned for some adorable Jade baby bump pictures!! Lots going on in 2015! 2015 is going to be really exciting for us here at Willamette Valley Australian Bulldogs! 2014 was a horrible year! We had an unexpected large move towards the end of the year which resulted in having to put the breeding program on hold. We are now back on our feet and going full speed ahead! We appreciate everyone's patience as we were unable to answer emails and inquiries until now. We have great news! We are currently working to import our new "Stud" from Australia. It is quite a task to make sure we get just the right one. 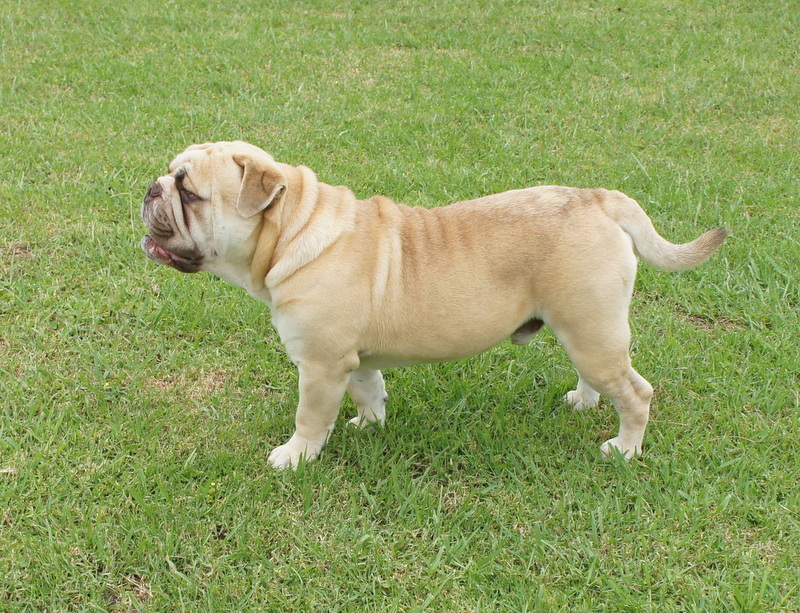 We are happy to say that thanks to Bungaree Australian Bulldogs Tex our new Stud will be arriving next week! This is amazing news and is going to save our breeding program having an in-house stud of our own! He has been fully health checked and already has 2 successful litters on the ground in Australia. We have 3 potential litters planned for 2015. Roxy is looking like she is going into heat now and we are trying to get Tex here ASAP so that we can do a mating between them. This will be Roxy's last litter. Bindi will be having her 1st mating this year and it will be with our new imported stud Tex. 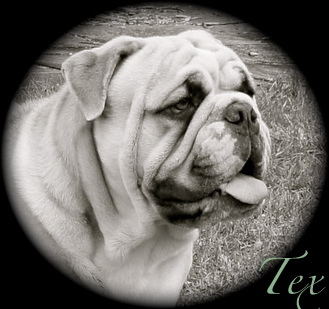 Jade will also be 2 this year and will also be mated with our stud Tex. I know our families are ready for their puppies now but please be patient as these litters will be worth the wait! So excited to see all these babies!! 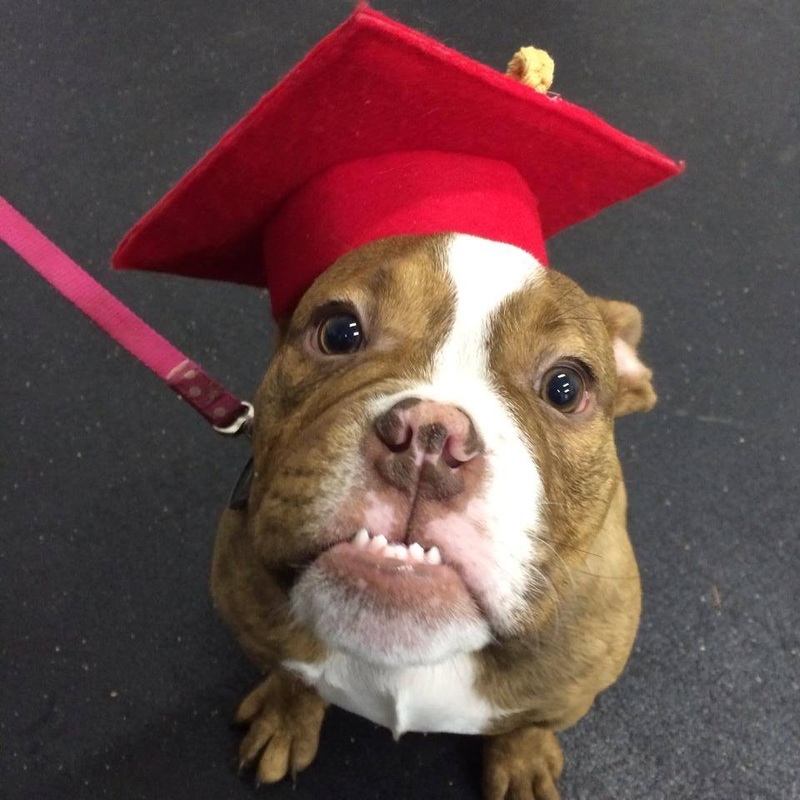 Jade is a AKC Star Puppy Graduate at Educating Fido! So proud of Jade and my son for working together as a team and learning so much! Click the video below to watch Jade in action! 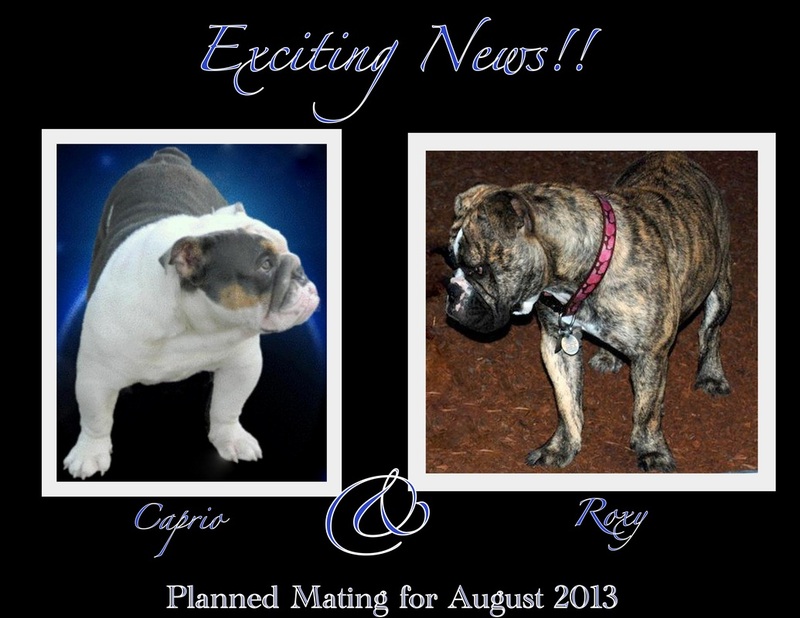 Puppies due the second week of October 2013!! Time for our 2013 Breeding!! After a very rough breeding year in 2012 we have high hopes for success in 2013!! We would like to thank all of our future puppy families that have stuck with us and waited patiently!! This is an amazing match!! Caprio from Rare Bulldogs is amazing and we are so grateful to Rare Bulldogs for allowing us to us to use him for our stud for this litter!! He is a rare Blue Tri BBD so he carries the blue gene, tri color gene, and the liver or chocolate gene. Roxy also carries the liver gene. All puppies will carry the blue gene and approx 1/3 of them will carry the liver gene. This mating will be taking place later this week and we are hoping and praying for a successful mating. These two will produce a 90% litter filled with super rolly ancolorful litter producing many colors, brindles, and livers!! 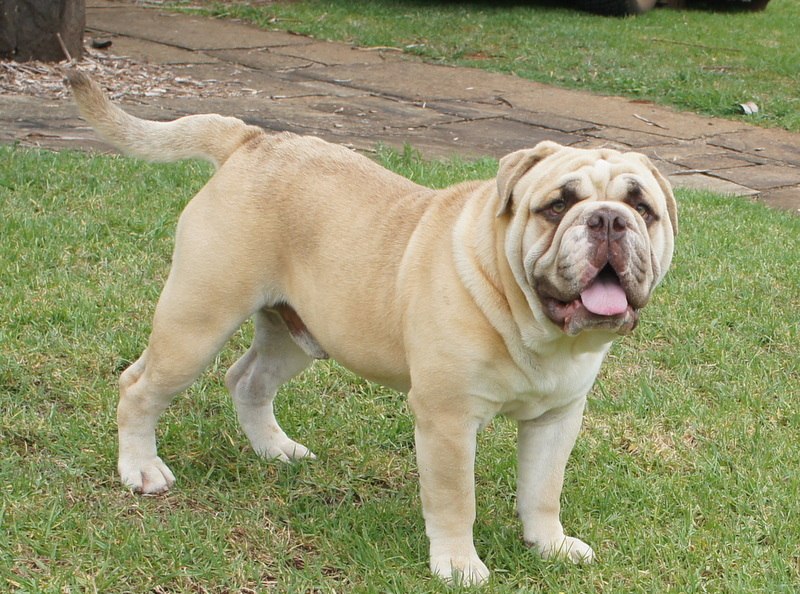 Almost 4 years ago we imported our 1st stud puppy Dozer from Australia. He was the pick of the litter and we were so excited! He is a gorgeous Aussie with an amazing personality and perfect coloring!! The only problem was.... he arrived with some health problems. 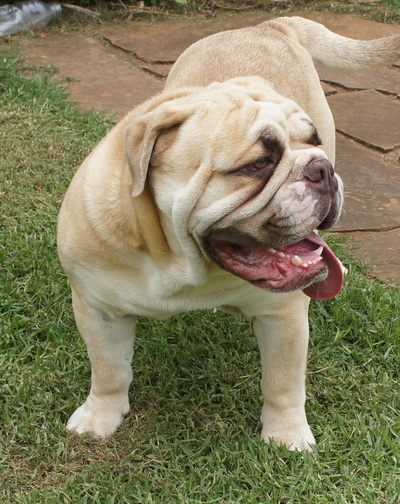 He had a double cherry eye which required multiple surgeries and he had undescended testicles. We waited till he was a year old in hopes that his testicles would drop but they never did. 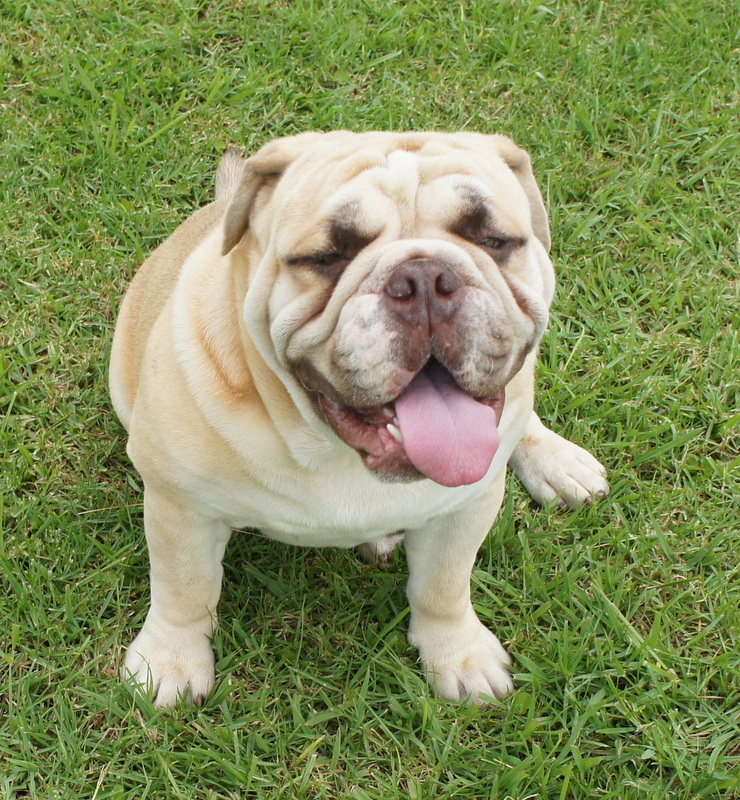 Knowing that we wanted to base our program on health and personalities first and foremost we made the difficult decision to have Dozer desexed. It was devastating to our program and it's been a struggle ever since because we have had to depend on outside Stud services from other breeders that we know and trust. Not only is it more difficult but it is also extremely expensive. Now after our breeding program has been around for 4 years, we have found the perfect match of bulldog parents to make our future stud boy!! 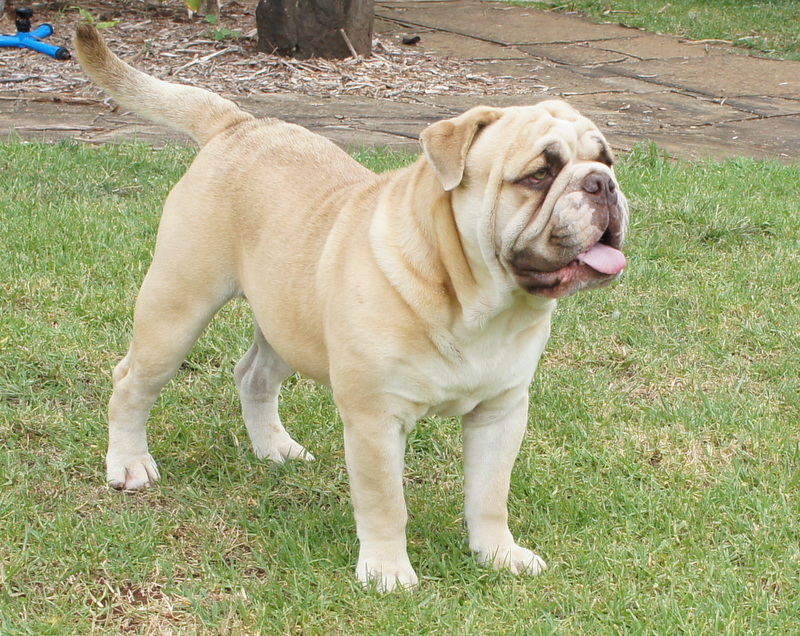 He is due to be born at Karinya Aussie Bulldogs in September 2013. His parents have excellent hip and elbow scores and he will carry both the liver and blue color genes, he may even be blue! Wish us luck!! Thank you Karinya Aussie Bulldogs for allowing us 1st pick of the boys! Wow!! Great Doggie Playgroup tonight!!! Tonight was so much fun! I took Cali to Doggie Playgroup at our favorite Trainers, Cindy @ Regarding Rover and Cali did AWESOME!! The other dogs there tonight were a Beauceron, a Giant Rottie, and a yellow lab. They all had a blast! who would think that 4 totally random dogs could have such a blast off leash together!! They were all sweethearts! Lots of play and absolutely no fighting :) Cali fit right in, it was her first week at Playgroup and she was a rockstar! No fear, eager to meet everyone and just had a blast with big and small dogs alike! I'm so proud of my Cali Girl!! After class we went right to Petco and bout her 2 new Kongs as a reward! Now she is fast asleep (so worn out from playing) that I can hear her happy bulldog snores all the way in the other room! Love her! Tons of Exciting Things Coming Up for 2011 !! Happy New Year everyone!!! We are very excited about 2011! There are so many incredible things that are going to happen! In February Willamette Valley Australian Bulldogs is officially moving to our new home on acreage where our Bullies can run play and enjoy the beauty of the Willamette Valley Wine Country! 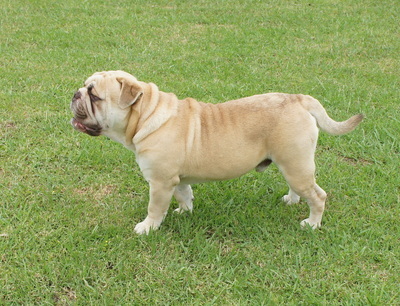 Towards the end of March we are expecting Roxy to go into heat at which time she will be mated to Emitt of Michelle's Bulldogs in California. This is a very special match that will produce some very exciting and rare colors! 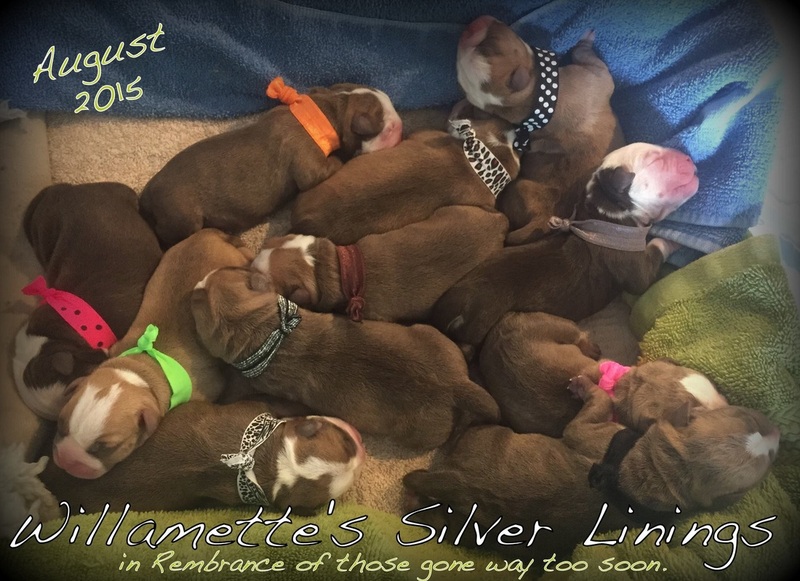 Due to the rare colors this litter will only be sold to Pet Only homes. We will be keeping a Male Puppy from this litter that will become one of two Studs here at Willamette Valley. We are hoping for one, possibly two litters towards the end of the year as well which have yet to be announced. Stay tuned for more updates as this exciting year progresses! !